This is Orwell’s answer to that question all writers attempt to answer at some point. 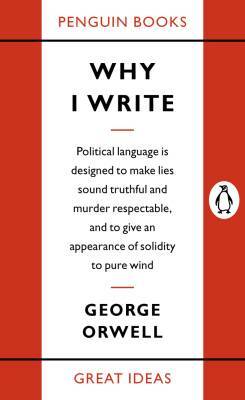 It is almost a biography of Orwell’s writing life and interestingly was published a couple of years before his highly influential Ninety Eighty-four. No prizes for guessing which was Orwell’s greatest motivation. He elaborates on each of these with reasonable conviction. The second motivation is my favourite. Orwell explains aesthetic enthusiasm as taking pleasure in “the impact of one sound on another, in the firmness of good prose or the rhythm of a good story. Desire to share an experience which one feels is valuable and ought not to be missed.” I feel like this should be a strong motivation to write – especially perhaps poetry – but Orwell says “The aesthetic motive is very feeble in a lot of writers, but even a pamphleteer or a writer of textbooks will have pet words and phrases which appeal to him for non-utilitarian reasons.” ! Writing a book is a horrible, exhausting struggle, like a long bout of some painful illness. One would never undertake such a thing if one were not driven on by some demon whom one can neither resist nor understand. For all one knows that demon is simply the same instinct that makes a baby squall for attention. And yet it is also true that one can write nothing readable unless one constantly struggles to efface one’s own personality. Good prose is like a windowpane. I cannot say with certainty which of my motives are the strongest, but I know which of them deserve to be followed. And looking back through my work, I see that it is invariably where I lacked a political purpose that I wrote lifeless books and was betrayed into purple passages, sentences without meaning, decorative adjectives and humbug generally. That’s really interesting Sarahda, thanks for sharing it. I’m curious if your next post will be about why you write. I’m always interested in people’s answers to that question.